The new Fluke 5522A Multi-Product Calibrator addresses a wide calibration workload and comes with internal and external protection features that protect it against damage and make it easier to transport for on-site or mobile calibration. The 5522A can also be fully automated with MET/CAL® Plus Calibration Management Software. It is the ideal calibrator for metrology professionals who need to calibrate many different types of electronic equipment and want a transportable instrument that offers them a high return on investment. The 5522A sources direct voltage and current, alternating voltage and current with multiple waveforms and harmonics, two simultaneous voltage outputs or voltage and current to simulate dc and ac power with phase control, resistance, capacitance, thermocouples and RTDs. 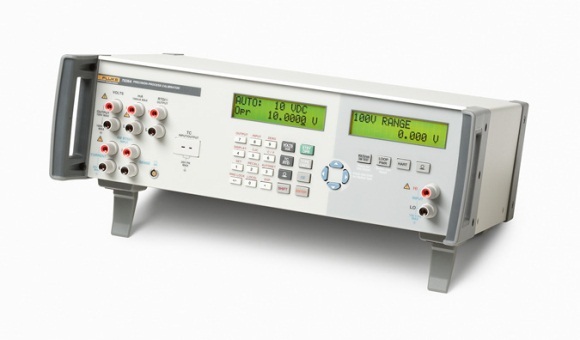 The 5522A can also measure thermocouple temperature, and pressure using one of 29 Fluke 700 Series pressure modules. Two options add the capability to calibrate oscilloscopes either 600 MHz or 1.1 GHz. And the 5520A-PQ Power Quality Option enables the 5522A to calibrate power quality instrumentation to the standards of the IEC and other regulatory agencies. Click here for further information on this product. Fluke Calibration, a leader in precision calibration instrumentation and software, has now launched a new website that consolidates the resources from its previous sites. The website, www.flukecal.com, combines all the information from hartscientific.com, dhinstruments.com, and the calibration-specific sections of fluke.com into a single, rich resource for calibration and metrology specialists. The new website provides comprehensive information about more than 240 Fluke Calibration electrical, RF, temperature, pressure, and flow hardware and software products. It also consolidates products formerly under the Fluke, Hart Scientific, DH Instruments, Ruska and Pressurements brands under the Fluke Calibration brand.